Smart Digital Inverter Technology Refrigrators 192 litre capacity. You can see list of our Samsung RR20K282Z-U2/R2 vs Samsung RR20M1Z2XR7 below, perform Side-by-Side comparison. If you need further help, do have a look at Conzumr Guides and Tips. Alternatively you can view all Refrigerator to choose your own favourites. 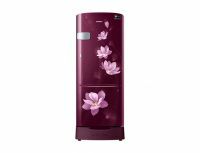 This Samsung Smart Refrigerators comes with Grande Door design and attractive floral . This Refrigerators Digital Inverter Technology automatically adjusts the compressor speed in response to cooling demand across 7 levels. It uses less energy, minimises noise and reduces wear and tear for longer-lasting performance. This Refrigerators Has a truly distinctive Crown design that is available in a choice of various colours. It’s softly curved, round-top shape and clean lines, without any extra doors, add a sleek and elegant look your kitchen. It's Stabiliser Free Operation means it works very steadily and reliably and prevents electrical damage or shorting if there are any voltage fluctuations. The samsung refrigerator has a smart digital inverter technology automatically adjusts the compressor speed in response to cooling demand across 7 levels. The cool wave feature in the freezer of this samsung refrigerator comes to the rescue during power outages. It keeps food chilled up to 9 hours. It has toughened glass shelves that are designed and tested to hold a weight of up to 150 Kg safely. It’s BEE 5 star rating makes it one of the most energy efficient refrigerators available. This refrigerator comes with base stand drawer and plastic bags and separate bottles. Glass: It is stronger, more durable and less prone to cracking and breaking than regular glass. As a result, these shelves are more durable than plastic shelves, which crack and break under stress, and wire shelving, which tends to sag under the weight of heavy objects. To Recieve updates and possible rewards for Samsung RR20M1Z2XR7 please sign in. To Recieve updates and possible rewards for Refrigerator please sign in.